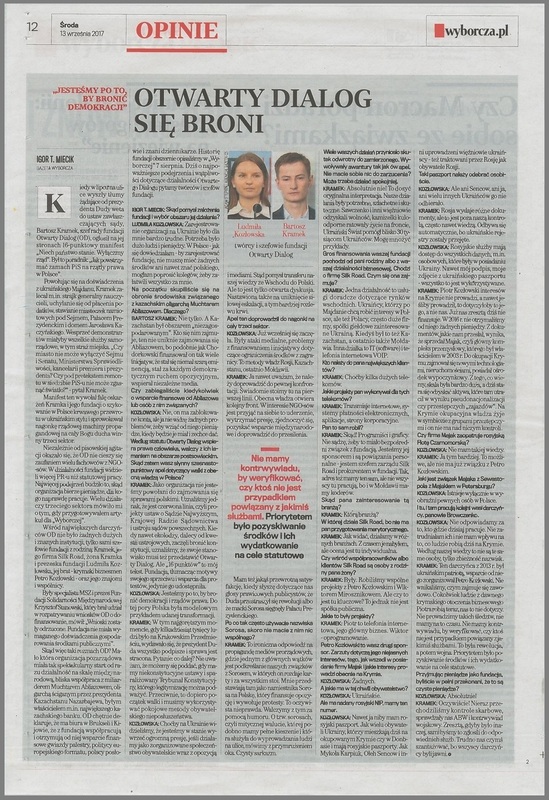 On Wednesday, 13 September 2017, Gazeta Wyborcza published an interview, given by President of the Open Dialog Foundation Lyudmyla Kozlovska and President of the Foundation Board Bartosz Kramek to Igor T. Miecik. The text, entitled ‘Open Dialog is defending itself’, is presented below. It is aresponse to GW’s previous publications which we broadly discussed in The statement on Igor T. Miecik’s articles (Gazeta Wyborcza, 7 August 2017). Andrzej Wielowieyski also spoke about the Open Dialog Foundation in GW: The voice in defence of the Foundation Open Dialog at the crossroads. Igor T. Miecik: Where did you get the idea of establishing a foundation and how did you select the area of its activity? Lyudmyla Kozlovska: Registering an organisation in Ukraine would be very difficult for me. It would take a lot of people and money. As I found out, in order to register a foundation in Poland, I do not have to have any financial means, or even know Polish, I only needed to ask my friends to do everything for me. Initially, you focused on defending the environment associated with the Kazakhstani oligarch Mukhtar Ablyazov. Why? Bartosz Kramek: Not only. And Kazakhstan was an ‘untouched’ area. No-one who deals with this area will be able to avoid dealing with the case of Ablyazov, as, similarly to Khodorkovsky, he financed so many initiatives that he became almost a gray eminence, the mastermind behind every democratic opposition movement, and he supported independent media. Have you ever sought financial support from Ablyazov or anyone associated with him? Kozlovska: No, his bank accounts are blocked, but I wouldn’t have a problem if we take the money once he gets it back and provided that he will be willing to give it. According to the Charter, the Open Dialog Foundation supports human rights and fights against their violation in the post-Soviet area. So why does your famous 16-point appeal regards the fight against the current power in Poland? Kramek: As an organisation, we are not called to deal with Polish affairs. We have, however, come to the conclusion that there is a red line, that is, the draft laws on the Supreme Court, the National Council of Judiciary and the system of common courts. In a situation when even environmentalists, who are far from constitutional issues, began defending the Constitution, we felt that the Open Dialog should also present its position on the matter. But "16 points" is my own text. The Foundation only made it available, thus explaining the motives of its opposition and support for the protests. Kozlovska: We are here to defend democracy and the rule of law. Until recently, Poland had been a model of successful transformation. Kramek: At the hottest moment when dozens of thousands of people were gathered at the Krakowskie Przedmieście Street, it seemed that President Duda would sign everything and people thought that the case was already lost. The question is: What to do next? I think we cannot surrender when we have unconstitutional laws and paralyzed Constitutional Court whose legitimacy can be undermined. On the contrary, it is only the beginning of the struggle and we need to use peaceful means of civic disobedience. Kozlovska: Even when in Ukraine, we saw that we were able to exert enormous pressure if we acted as an organised civil society along with the opposition and the media. Hence, the idea of transferring our knowledge from the East to Poland. But this is just an open discussion. It is also intended to avoid escalation and, the more so, bloodshed. This appeal led to the smear campaign against the third sector. Kozlovska: The smear campaign has already started. There have been media attacks, problems with funding, and initiatives aimed at restricting foreign funding. These are the methods used by the authorities of Russia, Kazakhstan, and, recently, Moldova. Kramek: I even think that a certain confrontation should be made. We are consciously standing on the front line here. The present authorities are opening another frontline. It is in the interest of the NGOs to accept the impact, to stand the pressure, to unite, to gain international support, and to bring about a solstice. I also have some perverse satisfaction when I hear about the voices of right-wing journalists, speaking about us, saying that Duda got afraid of the revolution, or that Soros's tentacles reached the presidential palace. Why do you use Soros’s name so often if you have nothing to do with him? Kramek: This is an ironic response to the propaganda of pro-government media, where one of the main themes is highlighting our relationship with Soros, where he handles cards and is the true mastermind behind everything. They present me as Soros’s deputy to Poland, who finances the opposition and provokes protests. This is obviously not true. We fight against it using humour. We speak with a grain of salt about the so-called soroses, or mythical currency, which is said to fill our pockets and which served to bring people to the streets. Pure sarcasm. A number of your actions have had the opposite effect, provoking a fuss like that call. Don’t you have anything to reproach yourself for? Maybe you need to act calmer. Kramek: By no means! This is a quite extraordinary interpretation. Our actions were needed; they were noble and effective. Savchenko and other prisoners regained their freedom, bulletproof vests saved lives on the frontline; the ‘Ukrainian World’ Centre rendered assistance to approx. 30,000 Ukrainians. I can give numerous examples. The majority of the means in your foundation comes from your family or from your business activity. I mean the Silk Road company. What does it deal with? Kramek: One of the activities is rendering advisory services regarding the Eastern markets. Ukrainians, who wish to do business in Poland following the Maidan events, but also Poles, often large companies, stock companies interested in Ukraine. Previously, it had been also Kazakhstan, and, recently, Moldova. Another branch is IT (software) and VOIP Internet telephony. Kramek: For example, several large telecoms. What projects did you do for these telecoms? Kramek: Internet transmissions, electronic payment systems, applications, corporate websites. Kramek: Of course not! Developers and graphic designers did that. I do not think it has any direct connection with the foundation. We are its sponsor and there are personal connections - I am the head of the Silk Road Board and a proxy in the Foundation. Yes, we have the same address, but not all of us work here, because we also have programmers in Moldova. The one in which the Silk Road operates; you don’t have the necessary qualifications. Kramek: As you can see, we work in various areas. Over time, I acquired them, but everyone can assess it differently. Are there any members of your wife's family among Silk Road employees or clients? Kramek: There used to be. We carried out joint projects with Petro Kozlovsky and Viktor Miroshnikov. But is this of key importance here? After all, this is not a public company. What kind of projects were they? Kramek: Petro works in the Internet telephony industry, it’s his core business. Viktor deals with software. Petro Kozlovsky is your second sponsor. The allegations concern his unclear business deals, the manner in which he came into the possession of the Mayak company and the business in which he is currently involved in Crimea. Kozlovska: He isn’t involved in any business. What’s his citizenship right now? But he has a Russian tax ID, we have this number. Kozlovska: Even I reportedly have a Russian passport. Similarly to numerous citizens of Ukraine who live in occupied Crimea or Donbass today and ‘have’ Russian passports. Just like Mykola Karpyuk, Oleh Sentsov and other kidnapped Ukrainian prisoners - they are also treated by Russia as Russian citizens. Such passport has to be collected in person. Kozlovska: But neither Sentsov, nor me, nor many other Ukrainians collected it. Kramek: Russia issues various documents, but it’s beyond our control, and, frequently, it’d done without our knowledge. It is done automatically, as Ukrainian registers have been taken over. Kozlovska: Russian services have access to all the data, including personal data, which were in the possession of Ukraine. Even my signature, my photo from the Ukrainian passport - everything is used. Kramek: Petro Kozlovsky doesn’t run any business in Crimea, and even if he did, it would consider him, not us. He doesn’t finance our activities now, anyway. In 2016, we didn't receive any financial means from him. The documents he sent us indicate that he sold Mayak, i.e. the main industrial complex he owned in 2003. Following the occupation of Crimea, he dealt with new technology, real estate and he owned a resort. From what we know, the scale was very large, and today, he is striving to recover the assets that he lost there as a result of quasi-nationalisation or illegal seizure of property. In Crimea, the occupation authorities live in symbiosis with criminal groups and he has no control over anything. Does the Mayak company supply the Russian Black Sea Fleet? Kozlovska: I am not aware of this issue. Kramek: And certainly, I am not aware, either. It’s possible, but it doesn't have any connection with Petro Kozlovsky anymore. What’s the connection between Mayak in Sevastopol and Mayak in St. Petersburg? Kozlovska: The connection only exists in the imagination of certain people in Poland. Your other donors work in both companies. Kozlovska: We are not responsible for who works where today. I didn’t employ them and I have no influence on what people do in Crimea today. To our best knowledge, these are not the same persons, the similarity of names is coincidental. Kramek: The donor in 2013 was a Ukrainian patriot, Petro Kozlovsky supported him. We did not inquire what he did for a living. Whatever the people from Petro’s former Crimean business environment do now, it has nothing to do with us. We do not carry out such investigations, we have no time for this. We have no counterintelligence to verify whether someone is linked to some services by any chance. It was a revolution, and then, a war. The priority was to raise funds and spend them on statutory purposes. By accepting money as a foundation, were you fully convinced that this was ‘clean money’? Kramek: Of course! We have been subjected to fiscal inspections several times, the Internal Security Agency and military counterintelligence verified us as well. Anyway, if it were otherwise, we would have reported it to the relevant services. It is difficult to blackmail us because all our donors were public. Onet analyses Marcin Rey’s report on the ODF. "Another attack on the Foundation and yet another disgrace"